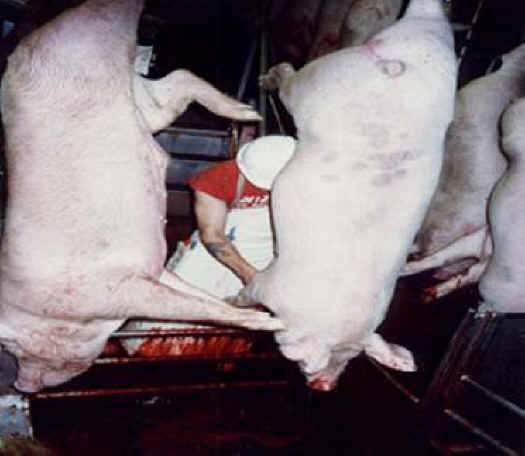 (Pig Exploitation - Slaughter - 2a) A worker cuts the pigs' throats and drains their blood. In many slaughterhouses, other terrified animals watch as the pigs further up in the line have their throats slit and are dunked into tanks of scalding-hot water. One slaughterhouse worker explains, "Bad-sticks [pigs whose necks weren't cut deep enough to open the veins] usually don't have enough time to bleed out. They end up drowning in the scalding tank before they ever bleed to death."